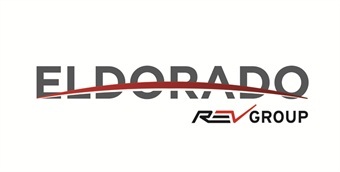 REV Group announced this week that bus manufacturer ElDorado National-Kansas has a new logo. The new streamlined logo's new color palette matches the REV family brands. REV announced that the steel gray represents ElDorado's culture of strength, deep red represents the passion for quality products, and the horizon line represents new horizons for ElDorado. They also removed "National-Kansas" from the new logo, though the company insists that the actual business has not changed. ElDorado National-Kansas, a subsidiary of a subsidiary of REV Group, manufactures light and medium-duty commercial buses for public transit, paratransit, airport, parking, hotel/resort, group tour, assisted living, church and university transportation markets. They are best known for their cutaway buses. which are the flagship of the Commercial REV Bus Brands. All vehicles are produced in the company's facility in Salina, Kan. The new ElDorado logo can be found along with all of the other REV brand names and product samples at select 2016 Nascar Xfinity Series races and the Phoenix Grand Prix on April 2.